The most important thing to keep in mind for treatment for a yellow jacket sting is to act quickly and seek immediate attention if you are allergic to stings. 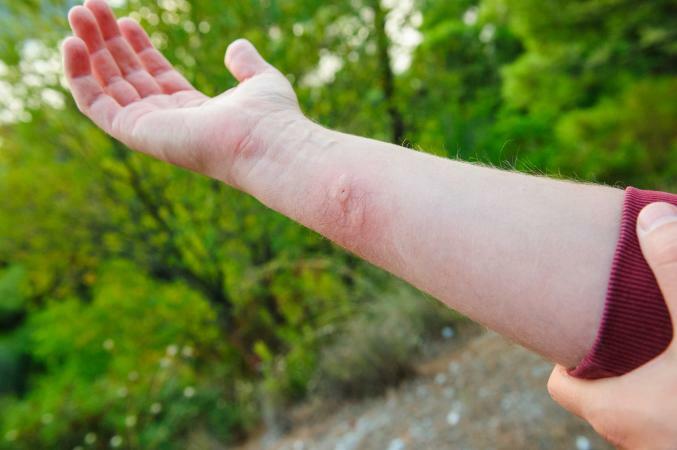 While many people just need basic over-the-counter (OTC) treatment for a yellow jacket sting, it's important to be aware of what to do if someone experiences an allergy, too. There are several ways to treat a yellow jacket sting. Treatment consists of treating the symptoms associated with sting. Yellow jacket sting treatment is similar to treating a bee sting. 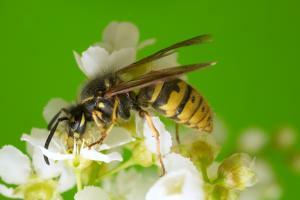 The most common symptoms of getting stung by a yellow jacket are pain and itching. Swelling of the sting site is also a common side effect. The symptoms from the sting should only last for 24-72 hours and then diminish. The best thing to do is to treat the sting site immediately. Be sure to clean the site with soap and water then apply either alcohol or peroxide. Normally, yellow jackets do not leave a stinger, but if one is present, use a straight-edge, such as a credit card or flat edge of a butter knife, to scrape away the stinger. Do not squeeze to get the stinger out, or you will release more venom into your system and will make the sting worse. Make a paste from a mixture of baking soda and water and apply it to the sting site. Hold ice on the affected area to reduce swelling and ease pain and discomfort. Dab ammonia on the area to reduce itching. Take an over-the-counter antihistamine such as Benadryl to relieve itching. To help with pain, take ibuprofen. This will also help with inflammation. Tylenol is also an option that can help with the pain. OTC sting medications such as swabs or ointments may also be used to treat itching and pain. Soak in a bath with Epsom salts to reduce pain, swelling, and itching. Apply a paste of meat tenderizer, which contains enzymes that help neutralize the venom. Apply vinegar to the site to ease itching. Apply a mudpack from soil and water to help draw out the venom. A salt paste will also help to draw out the venom. If you or someone you are with experiences any of these symptoms after getting stung, it is important to seek immediate medical attention. One of the most important things to keep in mind after getting stung is to act immediately. While most stings are effectively treated at home, some can become infected. Yellow jackets build their nests in cracks of walls and underground. They can carry anaerobic bacteria on their stingers due to visiting landfills. This is not the only reason for sting sites to become infected, however. Frequent scratching or improper initial treatment of the sting site can also cause infection. Infected stings need to be seen by a doctor and treated with antibiotics. A large local reaction that can measure ten inches or more in diameter. Increased pain at the sting site. Increased swelling and redness and the sting site. Drainage of pus from the sting site. A fever at the sting site. Symptoms last more than a day or two or get worse in that time period. Check your kit on occasion for any expired medications and replace as needed. Not everyone will get stung by a yellow jacket or react to a sting, but treatment timing is critical in preventing the spread of bacteria and venom. If you get stung, remember to clean and treat it immediately with either over-the-counter remedies or home remedies. If you are allergic to yellow jackets and get stung, remember to seek medical attention immediately. Yellow jackets are aggressive insects. If you see a nest or any flying around you, remain calm and give them a wide berth. A little room could save you a great deal of pain.